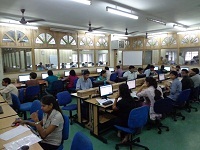 About the Laboratory: A state-of-the-art Computer LAB equipped with high-end Wipro PCs with 19" TFT Wide Screen Monitors. PCs in this LAB are interconnected with the latest Category 6 UTP cables in a STAR Network topology. Network is terminated in a structured manner with CISCO Managed switch mounted on a VALRACK with patch panels. 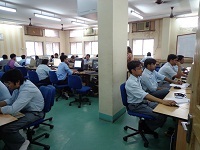 A total of 35 Computers provide students a comprehensive learning environment. All Computers run on latest and licensed Operating Systems. Software ranging from C, C++, and latest editors are installed in these PCs. About the Laboratory: A fully air-conditioned Computer LAB equipped with high-end HP PCs. PCs in this LAB are networked in a structured manner with CISCO Managed switch mounted on a VALRACK with patch panels in a STAR Topology. A total of 31 Computers have a dual boot environment. All Computers run on latest and Licensed Operating System. Installed applications Software include - C, C++, JAVA, JDK 1.6, RDBMS applications and others. About the Laboratory: Lab 316D, is the Network and Data Communication LAB. This LAB is equipped with the most advanced CISCO managed switch. Networked with the latest Category 6 UTP cables in a star network topology all computers in this lab are state-of-the-art. There are a total of 32 computers. All PCs are of latest configurations and of make ACER. Enabled with structured cabling with valracks and patch panels this LAB provides a real-world scenario to students with regards to networking. 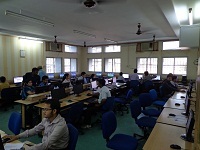 Here students are taught the intricacies of networking between 2 or multiple PCs by exacting the practical field through Crimping tools, LAN testers, RJ-45 connectors and UTP patch cords. A variety of advanced software modules are covered by highly skilled faculty(s). About the Laboratory: This LAB provides students with the latest in Multimedia and Web Technologies. This LAB consists of high-end computers with added Graphics and multimedia speakers. There are a total of 35 computers with the latest configurations. All computers are networked in a star topology with Catergory 6 UTP cables, terminated in a 9u valrack with patch panels. All PCs are on have the latest OS and softwares installed. About the Laboratory: LAB 316Q, is a newly created computer LAB with brand new PCs and state-of-the-art networking. 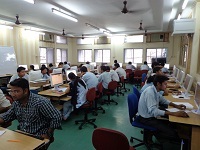 This LAB is called the Design and Project LAB, and is meant for students who have been allocated projects under Project guides. Equipped with the most advanced computing facility this LAB have PCs from cross-platform vendors ranging from HP, Acer, Wipro and HCL. Varied softwares are available for enabling students to conceptualize, design and create projects. Various Databases ranging from MS SQL Server to Oracle 9i provide students with varied opportunity. This Project LAB also has a dedicated leased line internet connectivity for ready references. The whole IT infrastructure of Narula was recently revamped and redesigned with the latest products. It now boasts of a complete fibre optics backbone to enable end users with a fast and dedicated network. A total of 39 Mbps of dedicated bandwidth provides super fast internet browsing experience. The Cyberoam UTM provides security from Viruses, malware and spam and enables delivery of a clean bandwidth. Narula's new Server room is state-of-the-art.